When you are going to have a baby, it’s like planning a fabulous vacation trip-to Italy. You buy a bunch of guide books and make your wonderful plans, the Coliseum, the Michelangelo David, the gondolas in Venice. You may learn some handy phrases in Italian. It’s all very exciting. “Holland?? ?” you say. “What do you mean Holland? I signed up for Italy! I’m supposed to be in Italy. All my life I’ve dreamed of going to Italy.” But there has been a change in the flight plan. They have landed in Holland and there you must stay. The importance of this is that they haven’t taken you to a horrible, disgusting, filthy place, full of pestilence, famine and disease. It’s just a different place. So you must go and buy new guide books. You must learn a whole new language. You will meet a whole new group of people you would have never met. It’s just a different place. It’s slower-paced than Italy, less flashy than Italy. But after you have been there for awhile and you catch your breath, you look around…and you begin to notice that Holland has windmills…Holland has tulips…Holland has Rembrandts. And the pain of that dream will never, ever, ever, ever go away…because the loss of that dream is a very, very significant loss. In many ways Fletcher is like a typical little boy...he absolutely loves when you tell him 'that's gross!' or say 'you're so stinky'. Today Fletcher sent his teacher running in the opposite direction because of all the snot he was producing. It was truly grossing her out...well he thought it was hilarious. I don't know that I've EVER seen him laugh out loud like this. He usually laughs but without noise so this is my most favorite video of all time! Hope you enjoy it as much as I do! Well we had a wonderful Thanksgiving spent with wonderful people! We had a house full and loved every minute of it. Craig and I picked up Fletcher at TCC and quickly brought him home. Boy was it great having him with us. We just feel complete when all of our children are together in our home. Craig's Aunt Susie came in from Houston for the holiday as well as her son, Stephen and his sweet family were here from Corpus Cristi. So great to see such lovely people. My sister Dawn and her husband Mike joined us for a quick visit too. Craig's parents Trudie and David along with Craig's sister, Kristi and her family were here too. Fletcher was in rare form that day and we were so thankful for that. 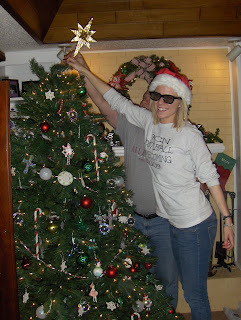 Today we decorated our Christmas tree which is always fun! 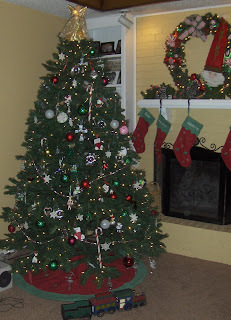 We've hung our stockings and tomorrow Craig and Kayleigh will put up the outside lights. I'm hoping to start my shopping next week. I just need to get a list made so I can start checking it twice! A lot to do around here! Hoping today is truly a day of thanksgiving for you and yours! It is for us. Today we will bring Fletcher home for the day. It's been a battle the last few weeks with TCC. Some things are changing up there and we're not very happy with the changes. TCC has decided that they don't want any of their equipment to leave the building for home visits. So now the equipment, ie ventilators, concentrators, O2, suction, feeding pumps, etc have to be rented by a medical supply company. Not very family friendly if you ask us. Not really understanding the reasons they're giving us either. Our hands are tied in this situation and we don't like it at all. So we've basically been battling with these people and it's made for a stressful time at our house. 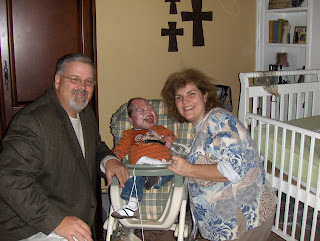 I will say the Lord is in control and He gave us favor in one area in particular when it came to Fletcher's ventilator. They were trying to send him home on an older model ventilator! Okay an older model feeding pump, sure. An older model suction machine, no problem. But the very source of his life support? No way!! But like I said, the Lord let TCC find favor with us and we are at least bringing Fletcher home on his vent. Thank you Jesus! I could go on and on with some of the things happening up there but I will not. Instead I'll focus on what I'm thankful for...I'm so thankful for my relationship with Jesus and that He loves me just the way I am otherwise I'd be in poor shape! 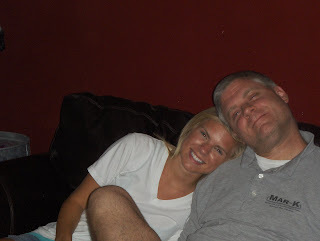 I'm thankful for Craig and the way he loves and cares for me and our children. 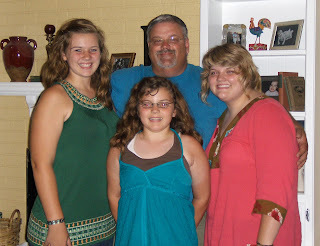 I'm thankful for my Kayleigh, my Maddie and my Fletcher what a source of joy they are to me. I'm privileged to be their mother and Craig's wife. 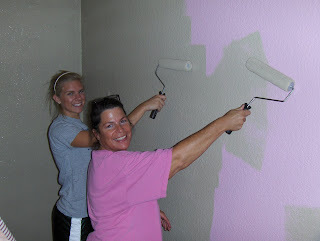 I'm thankful for my mom and the way she taught through example of how to make a home and care for children. 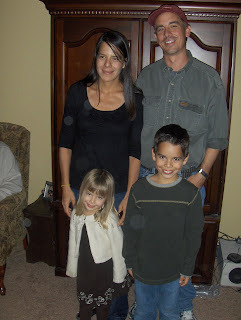 I'm thankful for my siblings...how fun it was to grow up with all of you. How fun it is be grown up with you and laugh and cry together and always know we have each other no matter what. I'm thankful for my in-laws and Kayleigh's grandparents. I really don't know what we'd do without their help and their wisdom and their guidance as we navigate parenting. I'm thankful Craig's sister and her family they're truly a blessing to us as well and lots of fun to be with! I'm thankful for my friends. I wish I could list you one by one but I am blessed with too many to for that. Just know you all are loved and appreciated! I'm thankful for my little grey house and the love and laughter that fill it's walls. I'm thankful for our cars. We just paid one of them off! I'm thankful for TCC even though it's not perfect it is serving it's purpose. There are truly so many things I'm thankful for these are just a few. I pray your Thanksgiving is filled with love, laughter and lots of good food and conversations today! Today Fletcher started the journey of using a gait trainer! He wasn't real jazzed about it at first I think just because after class he and I usually go on a walk around the building. Instead today after class we did gait training. Fletcher had a whole load of women that were behind me cheering him on! It was a great morning and I'm so looking forward to what the Lord has in store for this little guy! Fletcher's surgery went very well this morning. We left TCC at 5:45 and returned around 11:00 this morning. It was a very simple procedure since they just took out the port and didn't replace it. Fletcher bounced back quite well. He took a nice nap this afternoon while I was taking Maddie to see an endocrinologist and then to the dentist where we found that she has 4 cavaties. It's been a very busy day and we're all tired. Thanks for your prayers! Fletcher is still having problems with his port. The skin has not gown back over it and they have to keep a special dressing on it. And the dressing really bothers him and he just scratches at it anytime he can get his grubby little hands on it. We have come to the decision to remove Fletcher's port and NOT replace it. He's been doing so well lately and the last time he had Pamidronate they used a peripheral line and he did great. So there is really no need to have immediate access to a line. And it will give his little chest more time to recover from all the lines he's had over the last four years. The port that he has now is in his leg and it's been a pain in the behind since the day he got it. 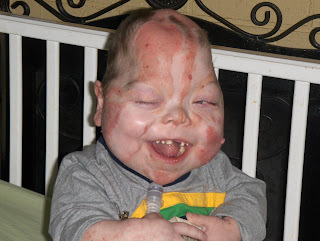 So, Thursday morning we'll go to Children's Hospital and Dr. Tuggle will remove that nasty ol' port. It's kind of a relief to think about one less thing to worry about with our boy. We'd appreciate your prayers. I'll keep you posted. Thanks! Since my last post on October 12 you'll remember I posted a video of Fletcher 'standing'. It took TWO people to help him stand. 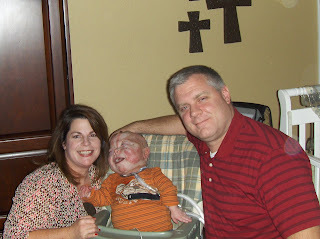 In 11 days Fletcher is only needing the assistance of ONE person to help him!! Watch him push down with his feet like he's supposed to! Proud doesn't describe how I'm feeling! They recently measured Fletcher's legs and one of them is 3/4 of an inch shorter than the other. They are having a special lift made for his shoe so that he'll be able to balance better. Once the lift is done Fletcher will get to start using a gait trainer, which is basically a walker. Exciting things are happening with our boy! Like I said in my last post we brought Fletcher home for Craig's birthday and we went to the Buddy Walk to support my niece Kylie, who has Down Syndrome. Fletcher did great, probably one of our best trips home! Fletcher is doing so well these days! 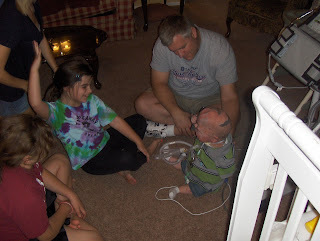 He's started standing in the stander twice a week and is doing great! We had his Patient Care Conference and he grew another inch! Two inches in six months! That's a miracle folks! 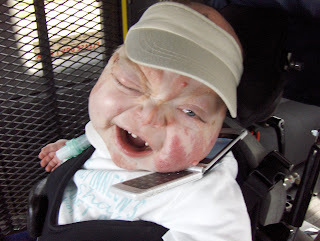 We saw a plastic surgeon this week about removing the nevus from Fletcher's neck, forehead and right temple. He'll be having surgery in about a month or so. We'd truly covet your prayers as we make decisions concerning the surgery...I'll keep you posted. But for now here's some fun videos of our silly boy! 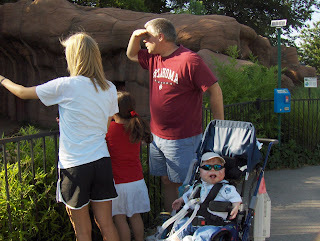 In late 2007 when we found out about Fletcher's rickets we had to alter his physical therapy...a lot. They eliminated a few things, adjusted a few things but one thing that was very important and very valuable was standing in the stander. His PT eliminated standing because it was just too dangerous with Fletcher's fragile bones. Well, for the last two Thursdays Fletcher has tolerated standing in the stander because this boy is growing, he's stronger and it's just time for him to start working on bearing weight! I can't begin to tell you how exciting this is for me. Fletcher looked so BIG and TALL in that stander yesterday and I was so proud of the forty minutes of his hard work! We did have to work overtime trying to keep him busy and distracted. 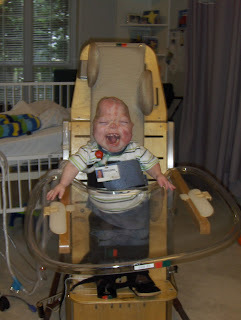 Fletcher is also rolling over now and bearing weight on his arms which is an amazing accomplishment for our little guy! I can't say it enough...the Lord is working a miracle in Fletcher! It's such a privilege watching the Lord at work in Fletcher's body. Almost two years ago we were working a plan of letting him go, managing his pain, preparing ourselves for the worst. 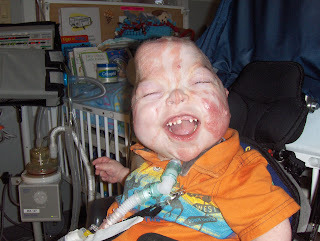 This boy was 'wasting away' his bones were, for lack of a better word empty! They told us he had the bones of a 95 year old woman. Look at him now! Nothing is going to stop him. I believe one day Fletcher Samuel Burns is going to walk! I'm so grateful to feel hopeful! He did it!! And with a smile on his face! 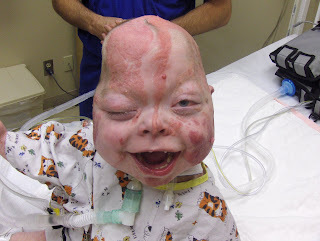 Fletcher's last Pamidronate infusion went well. We did have one problem. Fletcher had to have a peripheral line since we were having problems with the port. Well, on the second day of the treatment they found that his IV was in an artery instead of a vein! Not good! But it all turned out fine they changed it out and put it in his other foot and finished the treatment. Through the process we found that the port is clean. No MRSA and it's usable. Praise the Lord. They are keeping it covered and using a special bandage that should help the skin grow back over the port. So, we'll see what happens and I'll keep you posted. We are bringing Fletcher home today! We have a few things planned. 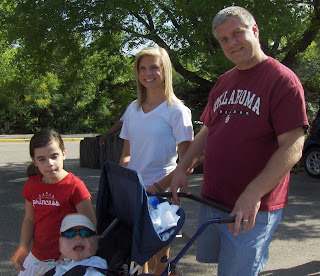 We're going to the Buddy Walk at the Bricktown Ball Park then home for football and a yummy birthday dinner for Craig! I'll post pictures soon. Have a great weekend! Today Fletcher started day one of a three day infusion therapy of Pamidronate. They had to start a peripheral line on him this time because his port is a mess right now! The skin around his port is colonized with MRSA so it's not safe to use the port because we don't want the port infected with the MRSA. The port had been oozing pus so they've been culturing it every week to see if it is growing anything so far so good, but the skin that covers the port is non existent and the actual port is visible! It is quite a sight to see. They are keeping it covered and working on different options to make sure we can keep it. Today Fletcher's dermatologist, Dr. Adelson came to check on him. Fletcher has several warty moles on his head and Dr. Adelson is trying to find the best and safest way to remove them. So that's been tabled for a bit. He also suggested that we start a relationship with a pediatric plastic surgeon. Fletcher is doing so well that we think it's a great idea as well. So I'll keep you posted on all that. We brought Fletcher home for Labor Day and enjoyed a wonderful time with our families and great food! Fletcher did extremely well we could tell he really enjoyed being at home. He didn't nap all day! Fletcher entertained all of us and we all entertained him! It was a great time at home for our family one of our best trips home so far. Fletcher is all personality these days! What a fun little kid he really is! We plan to bring Fletcher home on the 10th for Craig's birthday. 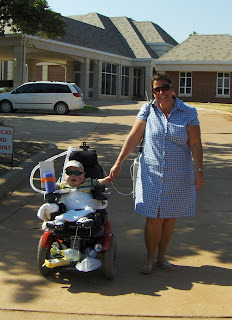 We're also going to take Fletcher to the Buddy Walk in Bricktown. It'll be a first for him. We're a little nervous but I think he'll be fine. I'll keep you posted! Well, that's all I've got for now! be a great school year for them. In other news, Fletcher is doing fabulous! 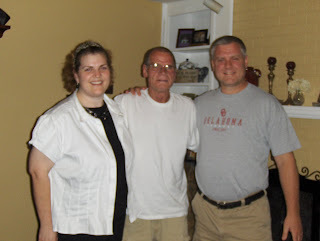 We had a Patient Care Conference (PCC) in July with all of his caregivers, it went extremely well. The best news of that PCC was Fletcher Burns has grown ONE FULL INCH since the his last PCC. Who cares, right? Listen to this...Fletcher literally has not grown since he's been at TCC. He's been 27 and 1/4 inches the entire time we've been there! The Lord is up to something with that boy! Fletcher's also starting to scoot around. His PT, Darcey is working with him to perfect his scoot so, he can use it to get around. It's really pretty hilarious and he has lots of fun scooting around on the mat in the gym. He's also sitting up unassisted for about 30 minutes at a time! Fletcher is getting stronger with each passing day. I feel like I'm witnessing a miracle and I feel hopeful for his future. Maybe he will come home and live with us one day? Maybe he will walk? Maybe he will talk? Maybe he will get off that darn ventilator? Only the Lord knows for sure, but it feels good to have hope for my boy! My boys! Oh how I love them! Sitting up all by himself and quite proud!! Playing on the mat with mommy! 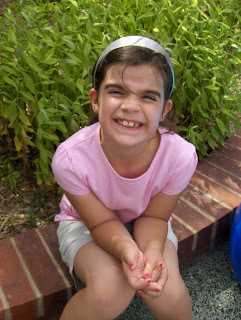 Maddie is doing well, too. She's probably going to have the toughest time out of all of us, with getting into the whole school routine. That girl really enjoyed sleeping in everyday! 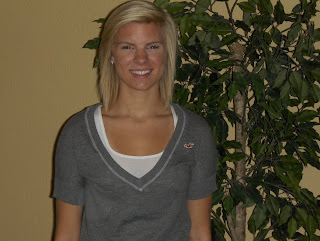 Maddie started dance last Monday. She's taking ballet and jazz. Two separate classes taught by two separate teachers this is a first for her. She's very excited about changing classes. Her ballet teacher is the daughter of the owner of the studio. 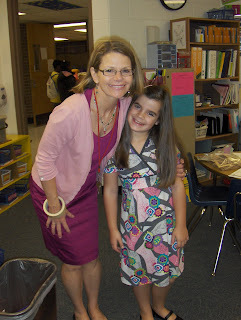 Her name is Savannah and she's probably 18 years old, well Maddie thinks it's so cool to have a teenage teacher. I think Maddie will really enjoy jazz. It's so up her alley! Kayleigh has had a very active summer. We drove her to Mississippi to visit her maternal grandparents and she stayed for four weeks! Craig, Maddie and I only stayed for a few days. We had a great time seeing family and friends. Her grandparents also took Kayleigh and one of her friends Marley to Gulf Shores and they had a blast! Laying on the beach and shopping what more could two teenage girls want? Kayleigh is now 15 and 1/2 years old so you know what that means? We're about to have a driver on our hands! UGH! How can it be that she's old enough to drive? 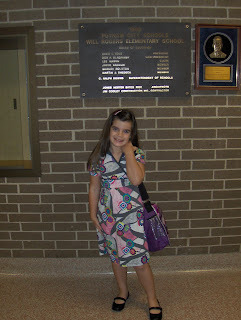 It seems like yesterday that I was taking her to her first day of school and snapping pictures with teachers and new backpacks and lunch boxes! She's really a delightful young lady and we're so proud of her! We're praying that this year is great and that she enjoys learning! 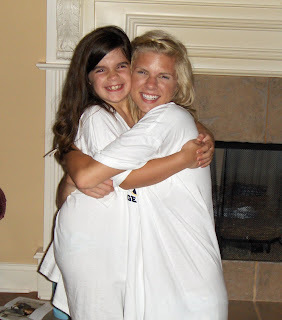 Maddie and Kayleigh one last hug! Craig and I are doing great! He's just working away and I'm so grateful to have a husband who goes to work each day without complaining to provide for his family!! God is good to the Burns family! Craig was invited to his college football 20 year reunion in Mississippi. We had a great time meeting all these football players we have heard about for years! 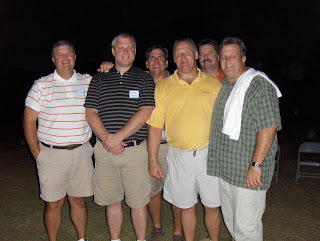 Craig and his linemen buddies! Go Choctaws! I began writing Fletcher's story and got side tracked awhile ago. Well, Maddie is sick and we've been home all day. So, I decided today would be a good day to 'finish' the story. This is the fourth installment if you'd like to read the first three they're on this blog as well. Click on 'Fletcher's Story' on the side bar. 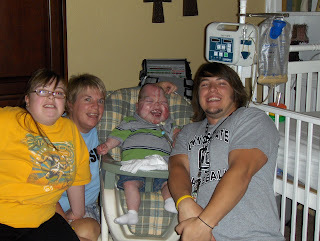 Here goes...Fletcher was hospitalized 4 more times that year. 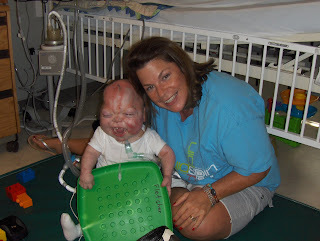 Each time we went straight to the PICU and he would be intubated each time. 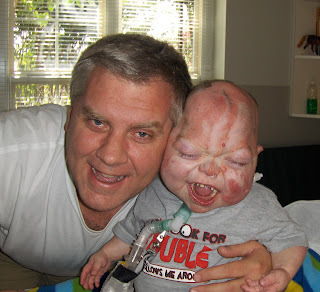 In August 2005 after 16 days at home Fletcher had to be hospitalized again. 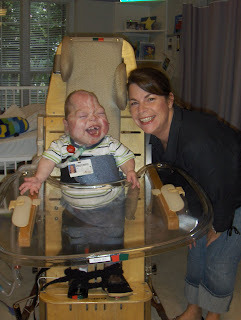 We were in the PICU for 41 days. 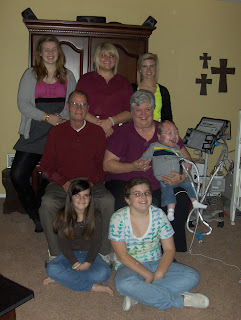 After having an Echocardiogram we found out that Fletcher had a heart condition called IHSS. 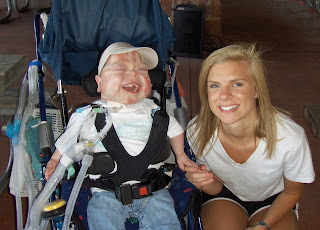 (Idiopathic Hypertrophic Subaortic Stenosis) Meaning Fletcher's heart was working and pumping so hard the muscle had grown bigger creating a stenosis and it was not allowing the blood in his heart to flow properly therefore he was retaining fluid in his lungs. Treatment options were up in the air because they weren’t sure what his underlying problem was. They’d been treating his lungs so aggressively they didn’t know if his lungs were causing his heart problems or if his heart was causing his lung problems. They began treating Fletcher with beta-blockers and calcium channel blockers, which are blood pressure medications. 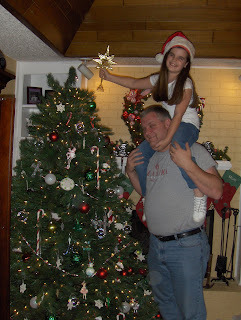 We went home on October 9, 2005 on the blood pressure meds. 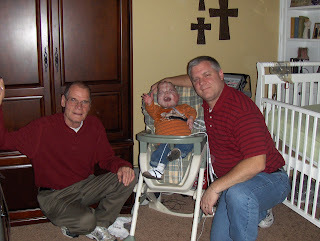 On October 27, 2005 I took Fletcher to what I thought was going to be a routine cardiology appointment. Instead that day will forever be remembered as the last day Fletcher lived in our home. Our cardiologist, Dr. Razook did an echo and EEG that day and decided the medication wasn’t working. Fletcher’s numbers were off the charts and he needed to be hospitalized, but first Dr. Razook wanted a second opinion from our pediatrician, Dr. Albiek. So, we left one doctor’s office to go to another and left Dr. Albiek’s office on a stretcher to go straight to Children’s Hospital via an ambulance. Now we’d been to Children’s Hospital for a heart cath but never been hospitalized there. Dr. Albiek pulled some strings so we were admitted directly to the PICU. Well, that little move resulted in us being treated like lepers, because according to one nurse, ‘we didn’t go through the proper channels to get there’. What she meant was we didn’t sit in the ER with 5000 other people with our VERY sick baby. Needless to say, Children’s Hospital was not my favorite place. 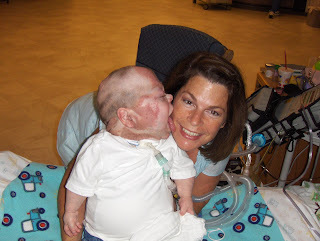 No one knew Fletcher there and none of the nurses or doctors loved and treated him the way we had become accustomed to at Baptist Hospital. But we had to be there because that’s where the heart docs were. Anyway, within the first few days of being hospitalized we found out that Fletcher had para-influenza and he was getting sicker each day. It also turned out that they wanted him to have open-heart surgery to repair the stenosis on his heart. He was so sick and one of the intensivist told me they had done all they could do for Fletcher and left me standing at his bedside feeling like I had been run over by a mack truck. 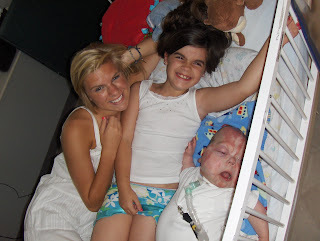 Since he was sick they didn’t want to operate on him, but if they didn’t he was going to die. 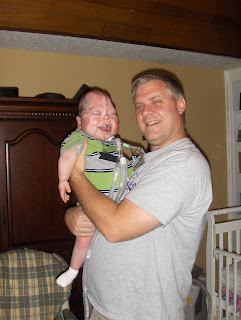 On November 10, 2005 Fletcher had open-heart surgery. It was a great success. The doctors were very pleased with how well the surgery and recovery process went. 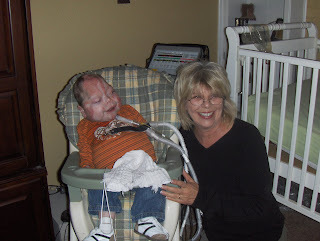 The week before he had surgery they put Fletcher on an INO ventilator, so he was on two vents at one time. Well, two days after surgery they weaned him completely off of the INO vent, he had one of two chest tubes removed, he also had a temporary pacemaker and he no longer needed it so it was removed. Three days after coming off the INO vent they tried to wean him off the regular vent. Well, that lasted about 6 hours and they intubated him again. They tried again to extubated five days later with no success. For two days his heart rate was a little high, but the doctors weren't concerned since the stenosis was gone. The plan was to try and get him off the vent, have some recovery time then take our boy home! This would mean that his heart problem had caused his lung problems and since his heart was fixed and we could go home and live our lives. They could not get Fletcher off of the vent so after 25 days at Children’s Hospital the heart surgeon, Dr. Pastuszko asked us if we’d like to go back to Baptist Hospital to see if they could get him off of the vent. We said YES!! We were out of there within a few hours. So, on November 21, 2005 we went back to what had become our home away from home, Baptist Hospital. We got all settled and the next day would be a day of meeting with doctors and trying to come up with a plan to wean Fletcher off of the vent. 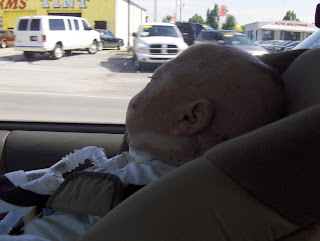 They tried several times to extubated Fletcher with no success. They told us it was time to look into long term care for Fletcher. Craig and I had to make some tough decisions. We prayed and we were prayed for and we found peace with our decision. 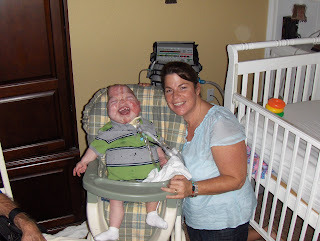 Fletcher was unable, at that point to come off of the ventilator, he couldn’t even tolerate the weaning process. Which told us his lungs had been causing his heart problems. His heart was fixed but his lungs were not. Craig and I, along with the PICU doctors and our pediatrician agreed that Fletcher would need a tracheostomy and ventilator support. 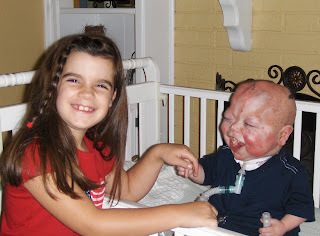 The way that our insurance worked we couldn’t afford to have a ventilator in our home, so after the surgery and some recovery time at Baptist, Fletcher went to The Children's Center in Bethany. 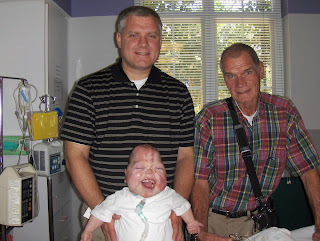 Craig and I toured the facility and found it to be a beautiful place where he would receive excellent care. 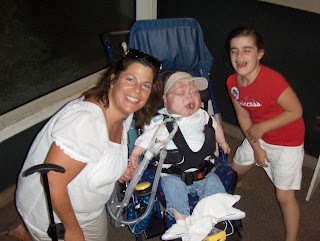 Fletcher would have 24 hour medical care and be able to have physical, speech and occupational therapy several times a week, which was so important since he had been in and out of hospitals for nearly 9 months. His little body was weak and he’d get what he needed at The Children's Center. 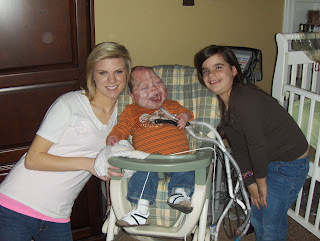 Our prayer was that his time there would rehabilitate him so he could get off the ventilator and come home for good. We talked at length with the girls and felt like they had a good understanding of what was going on with their sweet baby brother. At that point, Fletcher’s heart was working properly. Of course, his lungs were still very sick and they were trying some new medication to help his lungs. He was starting to have really good days and smiling a lot. That smile of his made everything alright! :) He had 6 teeth, 4 on top and 2 on bottom! He weighed about 171/2 pounds! He was growing up on us! We knew Fletcher would spend his first Christmas and his first birthday in a facility of some kind and we asked if it was possible for him to stay at Baptist. 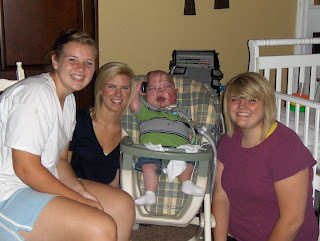 We loved the nurses and doctors there and were honored for him to spend a few more 'first' with them! He turned 4, 7, 8, 9, & 11 months in that hospital, one of the respiratory therapist found his first tooth and he spent this first Thanksgiving in the PICU. 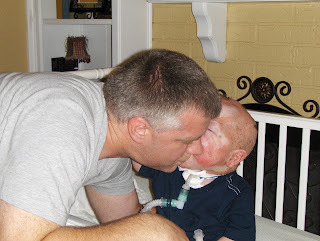 On December 16, 2005 Fletcher had surgery for a tracheostomy so he could handle being on a vent long term. We celebrated Christmas and his first birthday in the hospital. 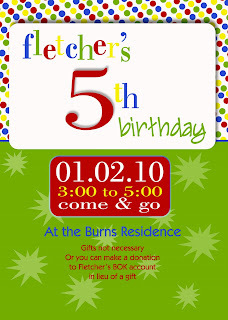 On January 9, 2006 Fletcher became a patient at TCC. 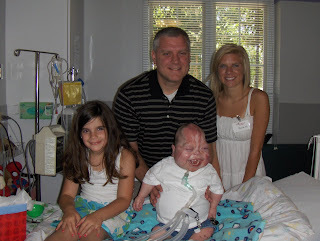 He’s been hospitalized three times since and had numerous surgeries since that day. 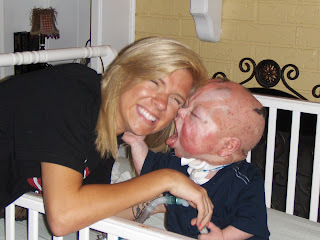 Days after his third birthday (2007) Fletcher was hospitalized, he was very sick. Everything that was going on with him was so complex and hard to understand and to explain. 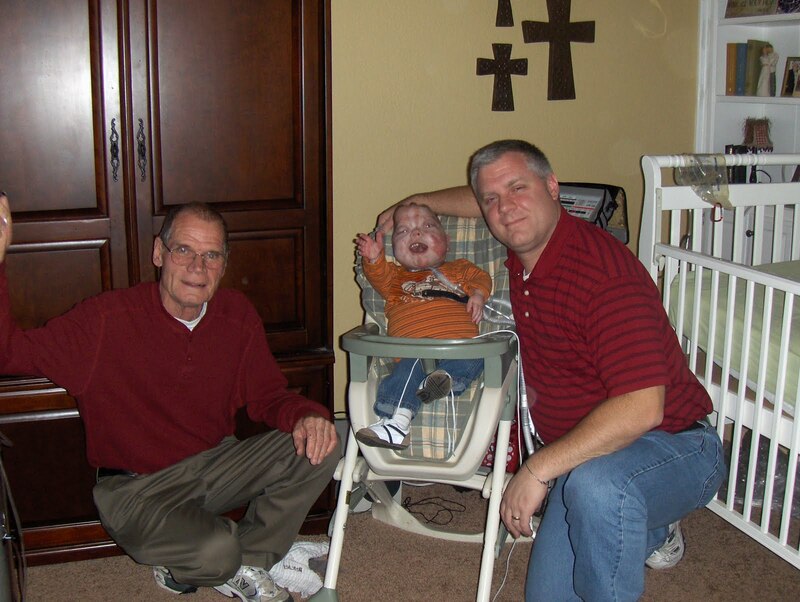 In November 2007 we found out that Fletcher had Hypophosphatemia Rickets, basically he had the bones of a 95 year old woman. He was very fragile and in critical condition. Fletcher was experiencing bone pain and very easily agitated. 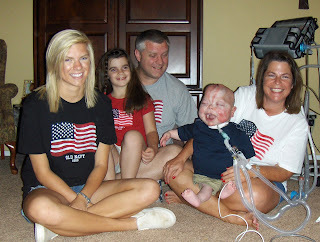 At that time we are trying to manage his pain and keep him comfortable without completely sedating him. He was having moments of smiling and giving us kisses. But his times of pain and agitation outweighed those good moments. They took x-rays of Fletcher's extremities. They showed us the films and what we saw was unbelievable. His little bones were bent and bowed and barely had calcium in them. His right arm had several old fractures, meaning his little arm had been broken several times and we didn't even know it! There were no new fractures on his arms and legs. They believed he had some compression fractures on his spine. They told us the problems with his electrolytes (calcium, phosphorus, sodium, potassium, etc.) were not fixable. We were told he was going to die. We had to make some decisions, we had to tell his sisters and grandparents that it was over and we started preparing ourselves for the very worst thing that could happen to any family. 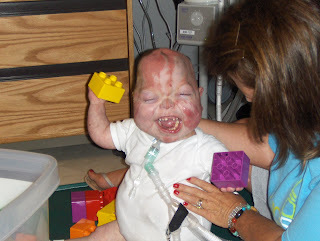 After 18 days in the PICU at Baptist Hospital they sent Fletcher back to TCC to die. 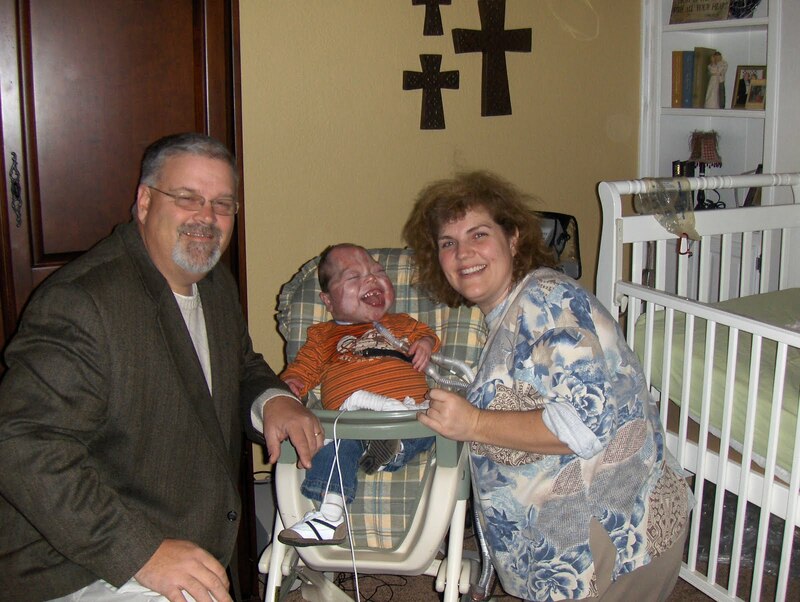 We knew that only God knew the number of Fletcher's days and nothing that we could do would change His sovereignty. As soon as we got back to TCC things started to turn around. 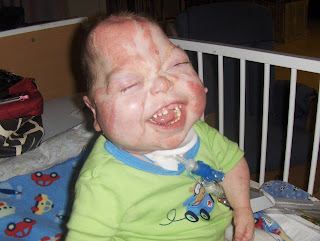 Fletcher was getting stronger with each day, he was happy and didn’t seem to have a care in the world. I believe we were watching a miracle in progress! 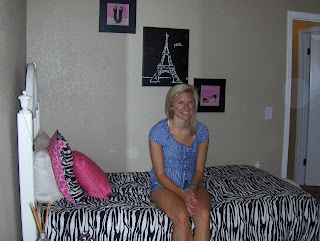 So let's see we've had Father's Day, Summer Fun Day at TCC, Fourth of July and we've given Kayleigh's room a little make over. There's so much more that I can't even remember so pictures are going to have to do this time! The pictures are out of order because of blogger. I do not know why it won't let me move the pictures around, oh well. Please know we are all doing very well. Just enjoying summer and all that goes with it. 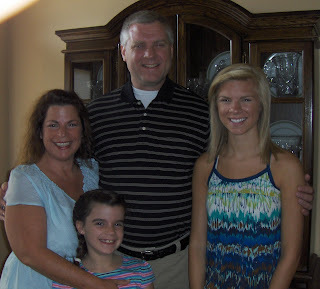 We will leave in the morning to take Kayleigh to her grandparents in Mississippi for her annual summer time trip. Craig, Maddie and myself will return on Monday but Kayleigh will stay for three or four weeks. Fletcher and me that's a power chair he's using!